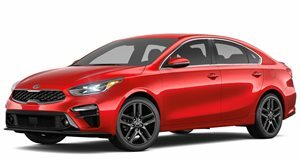 The all-new for 2019 Kia Forte is bringing a touch of luxury to the compact sedan segment. A solitary 2.0-liter 4-cylinder does duty in all trims, boasting 147 horsepower and 132 lb-ft of torque delivered to the front end. A 6-speed manual is on offer in the base FE trim, but all others make do with a continuously variable setup as standard. Base FE models are priced from $17,690, with top EX models starting at $21,990 and LXS and S trims slotting neatly in between. If value for money is what you’re after, the Forte S offers premium cloth seating, leather appointments, and extra speakers. The latest Forte should be enough to lure buyers away from the Ford Focus and VW Jetta. After an enormous breakfast and some wonderful hospitality from Kia on the media drive for the 2019 Forte, we were briefed on the car and then sent on our way to drive it. 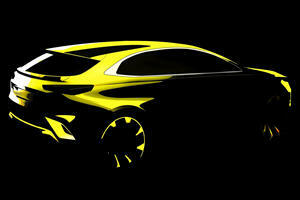 It was clear that Kia is proud of what it has achieved with halo models like the and , and the company has now . Aside from the massive styling updates, the big topic of conversation has to be the Forte's new continuously variable transmission, the first ever in a Hyundai or Kia product. Kia tells us in the briefing that it has gone to great lengths to make its CVT feel like a true automatic - sure, like we haven't heard that story from other automakers before. As soon as I had an opportunity to open up the throttle, I mashed it and waited for the accompanying drone of the CVT - it never came. As if right on cue, the transmission "shifted" with the grace of a traditional automatic. Without wishing to spoil the rest of the review, Kia's CVT is one heck of a first attempt and the car that surrounds it is clearly a massive triumph in the small sedan market. Before I had the chance to drive the car, Kia boasted that its Forte sales have more than doubled to over 117,000 units in 2017 since the second generation car's introduction in 2013. 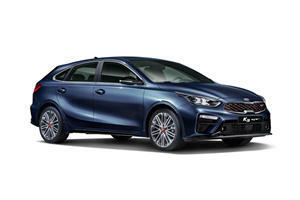 This sales success stemmed from the Forte's appeal as a first car, with many new buyers coming into the Kia brand as first-time car owners. The Forte possesses the key attribute that I think makes a perfect first car - it doesn't feel like a car which owners will grow out of. This new Forte punches well above its class in terms of size, features, and driving experience, in a combination that should appeal to all shoppers, not just first-time buyers. This 2019 model is an all-new generation, marking the third generation of the Forte. The new car looks far more aggressive than its predecessor due to obvious styling cues that are taken straight from the Stinger. The design team worked hard to emulate the Stinger's long hood and short deck to create a fastback-like shape, and although looks may be subjective, I really dig it. In terms of size, this new Forte grows by 3.2 inches to 182.7 inches in length, allowing for more legroom and space in the trunk. Cargo room is 15.1 cubic feet, which among the largest in the compact sedan segment. Under the hood sits Kia's second-generation 2.0-liter Nu four-cylinder engine producing 147 horsepower and 132 lb-ft of torque. While the engine doesn't really produce any more power than before, the big story (as mentioned earlier) is Kia's new Intelligent Variable Transmission (IVT), which replaces the old six-speed automatic. I'll talk more about how this transmission feels when I get to the driving section, but the switch from a traditional automatic netted a three-mpg average gain - 31/41/35 mpg city/highway/combined. I only managed around 31-mpg, but that was mostly a result of hard journalist-style driving and stand-still Pittsburgh traffic. Kia will also offer a six-speed manual transmission, which was not present at the launch event and will only be available on the base FE trim. Opting for the manual will shave off some of the efficiency gains with 27/37/31 mpg city/highway/combined. In addition to improving efficiency, Kia's goal here was to offer incredible value for money. A base FE trim with a manual transmission starts at $17,690 an $895 destination charge. The CVT bumps the price up to $18,590 while the LXS and S trims start at $19,090 and $20,190, respectively. The EX trim is where things really start to get interesting at $21,990. With a sub-$22,000 price, the EX is the trim I'd recommend most because it adds amenities such as smart key and smart trunk, leatherette seats with heating and ventilation. I drove the top-trim EX Launch Edition, which starts at $25,200 and adds adaptive cruise control, a sunroof, LED lights, a wireless charger, built-in navigation, and an eight-speaker 320 watt Harmon Kardon stereo system. These features are all very nice, though I'd be happy saving the roughly $3,000 to settle with the more-than-adequate EX trim. Kia also noted that the production EX Launch Edition will have darker wheels than what is pictured, a rear spoiler, and a Fire Orange paint color. Although I only had the chance to drive the highest trim Forte, Kia did do a nice job of equipping even the base models with a host of standard features. All 2019 Forte models are equipped with dual-zone automatic climate control, an eight-inch color touchscreen with Android Auto and Apple CarPlay compatibility, and safety systems such as forward collision-avoidance assist, lane keeping assist, driver attention warning, forward collision warning, and lane departure warning. There is also available safety features including blind-spot monitoring with rear cross-traffic alert and smart cruise control. Kia did a great job of translating the Stinger's sporty looks to the exterior of the Forte, but it would be almost meaningless if it didn't translate to the interior. Fortunately, Kia did an excellent job here as well. Some of the materials are hard-touch plastics, but most of the key touch points - the wheel, the shifter, the door armrests - are all soft-touch materials. The steering wheel, which was wrapped in a lovely leather-like material with excellent gripping points, was especially nice to the touch. The general layout of the cabin is excellent, and the design of the center console allows for two-tier storage in front of the shifter with an available wireless charger on the top level. The seats are extremely comfortable and feature a bit of bolstering for a sporty feel without feel uncomfortable. The EX Launch Edition I drove also had a power-adjustable driver seat with lumbar controls, to add to the comfort. The rear seats offer excellent leg and headroom and the trunk is cavernous for the segment. Now we get to the big question - what is the 2019 Forte like to drive? At first, I was . Kia was already a few steps ahead with an adaptive style shift logic that uses a chain-type belt instead of a push belt. This type of belt is typically used on mid-size vehicles, making this the first application on a compact car. Kia also wrapped the transmission in sound-insulating materials to eliminate the droning noise that is typically associated with CVTs. The results of all of Kia's hard work are difficult to believe. On the company's first go at a CVT, Kia has already surpassed the likes of Honda, Nissan, and Toyota in the compact segment. Even under hard acceleration, the transmission drops RPMs as if it really is shifting gears. The doesn't exhibit any of those moaning sounds that occur when a CVT picks one RPM point and sticks to it to maximize power. 95% of drivers may not even notice that this is a CVT. The other 5% may beg to differ but trust me, the old six-speed auto wasn't exactly PDK. Combine the excellent CVT with light steering and a comfortable ride, and the Forte really is a joy from behind the wheel. It is no speed demon, with 0-60 mph times estimated to be above nine-seconds, but that isn't why someone would buy this car. This is a competitor to the likes of the Honda Civic, Hyundai Elantra, Toyota Corolla, and many others. I spoke to Forte product manager Derrick Ty about the possibility of a new turbo model, which would likely offer a dual-clutch or six-speed manual mated to a 201-hp turbocharged engine. Ty couldn't confirm the existence of such a model in the pipeline, but I . If you are one of the 5% of aforementioned drivers who simply cannot live with a CVT, just wait for the sportier turbo model. Even without the presence of a "hot" version, the Forte still feels great to drive. Power rarely feels lacking and the suspension is extremely pleasant. The rear torsion-beam suspension can get a bit jumpy when the pavement gets really torn up, but 90% of the time it rides like a luxury car (expect the turbo model to feature independent rear suspension). Steering is extremely light and maneuverable but offers enough feedback to be fun. 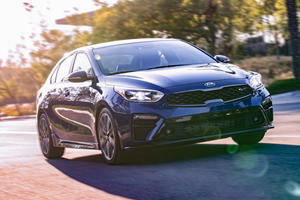 Kia has ditched the gimmick of making the steering incredibly heavy in Sport mode and has instead opted to make the Forte's steering a bit heavier all of the time to create a more fun and cohesive driving experience. When it comes down to it, the 2019 Forte is a stellar package. It offers excellent comfort and features all rolled up in a sporty looking vehicle at an affordable price. The 2019 Forte makes a great first car, one that first-time owners will want to keep for a long time. Factor in Kia's 10-year/100,000-mile warranty and this really does feel like a car that a 16-year-old could keep well after they finish up college and begin to start a family. The Forte shows very few weak spots and bashes the competition with sporty looks and luxurious features that are hard to come by at this price level. It earns a rating of Must Buy.